The structure of living organisms comes in gradual levels, beginning with the systems and then the organs, tissues, cells and finally the organelles. If we follow up this structural sequence of living organisms, we will find that the cells of any living organism are made up of organic and inorganic molecules, and each of these molecules is made up of atoms. The inorganic molecules in living organisms, such as water and salts, often do not contain carbon atoms. Organic molecules, such as carbohydrates, lipids, proteins, and nucleic acids, are large molecules containing carbon and hydrogen and are called biological macromolecules. Most biological macromolecules are called polymers. Polymers are made up of a combination of smaller molecules, called monomers, through a process called polymerization. Nucleic acids are biological macromolecules containing oxygen, hydrogen, carbon, nitrogen and phosphorus. There are two types of nucleic acids: Ribonucleic acid (RNA) and Deoxyribonucleic acid (DNA). Nucleic acids are made up of basic units called nucleotides which bind together by covalent bonds to form a polynucleotide or the nucleic acid. DNA is made up of nucleotides, and a nucleotide is made up of three parts: a five-carbon sugar (deoxyribose in the case of nucleotides in DNA), a phosphate group connected by a covalent bond to the sugar’s fifth carbon atom, and one of four possible nitrogen-containing bases connected with a covalent bond to the sugar’s first carbon atom. The nitrogen base may be one of the single-ring pyrimidine derivatives thymine (T) or cytosine (C), or one of the double ring purine derivatives adenine (A) or guanine (G). 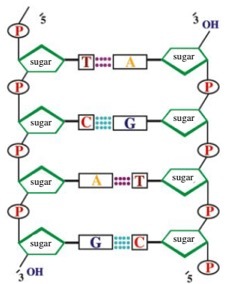 When the nucleotides are linked together in a strand of DNA, the phosphate group attached to the 5 (pronounced ‘five prime’) carbon of the deoxyribose sugar of one nucleotide becomes joined to the 3 carbon of the sugar of an adjacent nucleotide. The strand in which the sugar alternates with phosphate is called the sugar phosphate back bone. The backbone is not symmetrical. It has a definite orientation, with a free 3` hydroxyl group at one end and a free 5` phosphate group at the other end. The purine and pyrimidine bases stick out to one side of the sugar – the phosphate backbone. In each DNA molecule, the number of nucleotides containing adenine (A) equals the number containing thymine (T) and the number containing guanine (G) equals the number containing cytosine (C). That is A = T, and G = C.
The genetic code represented by a particular sequence of nucleotides in DNA is transcribed to a complementary triple sequence on mRNA, which goes to the ribosome where it is translated into a particular sequence of amino acids in a polypeptide, which makes a particular protein. But what is the number of nucleotides responsible for selecting the tRNA molecules which carry each amino acid? Twenty different amino acids are known to take part in the synthesis of proteins. At the same time, there are only four nucleotides involved in the structure of both DNA and RNA. Thus, the genetic ‘language’ must have a four-letter ‘alphabet’. These four nucleotides (letters) must somehow make up ‘words’, each of which stands for a particular amino acid. There must be at least 20 different genetic codes to specify the 20 amino acids. The words cannot be only one letter long because that would mean that there are only four possible code words (A, C, G and U) and proteins could contain only four different amino acids. Similarly, the words cannot be just combinations of two nucleotides, because four letters arranged in all possible combinations of two gives only 42 = 16 different code words, still not enough to specify 20 different amino acids. The four nucleotides arranged in triplets, however, produce 43 = 64 different code words, more than enough to produce a unique code word for each amino acid. The smallest theoretical size for a code word in DNA is, therefore, three nucleotides. By 1960, there was considerable evidence of a triple code, but deciding which sequence of three nucleotides coded for which amino acid (called codon) was very difficult. By 1965, these codons were derived in table 1. 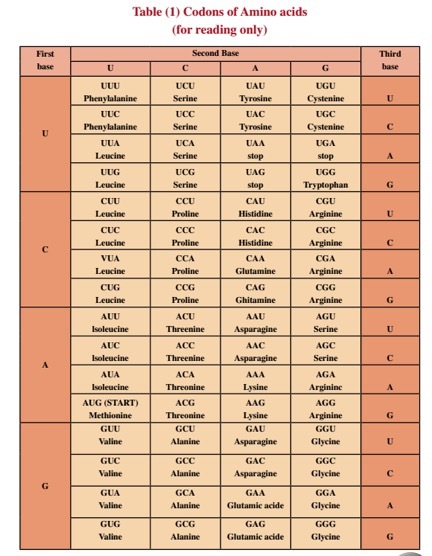 It should be noticed that the codons shown in the table are code words found in RNA, but the DNA code triplets are the compliments of those shown in Table 1. This reveals that the code is degenerate – that is, there is more than one codon for most of the amino acids. There is also a codon for the start of protein synthesis (AUG) and three stop codons (UAG, UAA and UAG) at which the protein synthesis mechanism stops and gives a signal. The genetic code is universal, and the same codons are used for the same amino acids in all viruses, bacteria, plants, animals and fungi that have been examined. This is strong evidence that all living organisms on Earth have originated from common ancestors. It seems that the code must have been established shortly after life originated, and has continued almost unchanged for billions of years since this time.